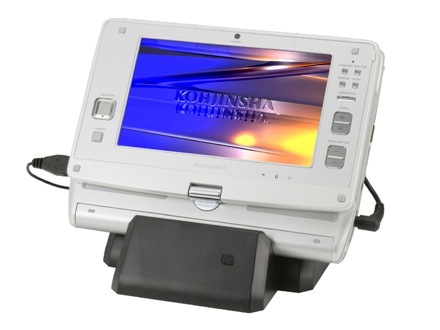 If you're a Kohjinsha fan (and trust us, UMPC pumpers love 'em) then you'll want to take note of this, their latest flagship mini. The new SH8-series eases the processor up a notch to an 800MHz Intel A110 while stiffening the disk to 120GB -- 32GB SSDs still available. Unfortunately, they've somehow managed to decrease battery life from 3.5- to 3.3-hours with the SSD, or 3.1-hours with an HDD -- a real no-no for ultraportables. You'll be looking at ¥238,000 (about $2,047) fully specced with a 1Seg TV tuner and Vista / MS Office pre-load when these hit Japan in September. Docked, white-on-black style after the break.